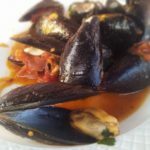 Fresh Gaeta mussels with garlic and chili: On the tiny Italian island of Ponza, mussels are often served in a simple white wine, garlic and parsley sauce but since Ada loves her chili, we’ll add a little to this recipe. 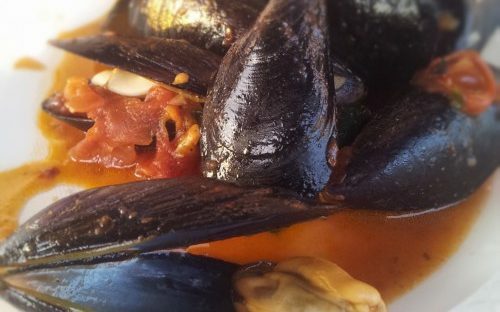 Although mussels don’t grow along the shorelines of Ponza because the water is too clean for them, they do grow along the shores of Gaeta and Formia where mussels are highly prized. Open the mussels by heating them for 3 – 5 minutes, without water, in a covered pan. In a separate pan, fry the garlic and chili over a low to medium heat until the garlic is lightly browned. Remove and discard the garlic and chili. Add the tomatoes to the oil and cook over a medium heat until the tomatoes break down to make a sauce. About 10 minutes. Add the mussels and the cooking liquid with the parsley to the tomatoes. Cover the pan and give it all a good shake then continue cooking for a minute or two to heat through.